Happy Birthday to Bend's UGB! It's been one year since Bend's new Urban Growth Boundary (UGB) and associated Comprehensive Plan update were implemented. 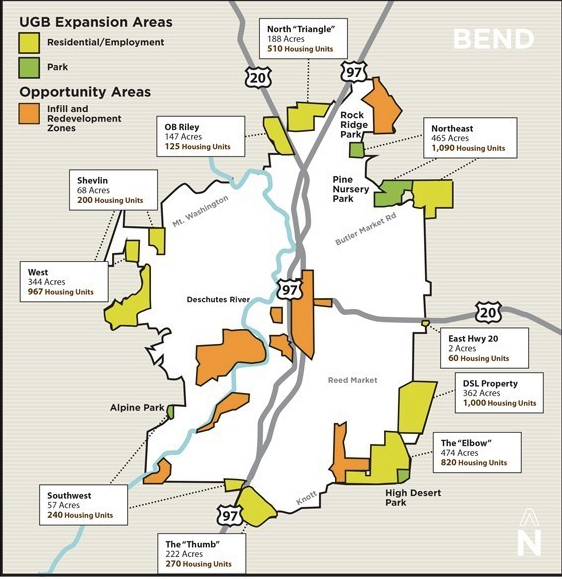 The UGB plan guides how the City of Bend will accommodate the rapid population growth expected through 2028. LandWatch was the leading public interest group advocating for a limited expansion to prevent urban sprawl, protect wildlife habitat, encourage cost-effective growth, and foster affordable housing throughout the lengthy UGB planning process. Thanks to extensive public outreach and community input, the new UGB balances providing more housing units with protecting existing neighborhoods by focusing density and redevelopment in several Opportunity Areas like the Bend Central District (BCD). Learn more about our BCD Initiative here. Reduced urban sprawl by 70% compared with the city’s original UGB proposal. Utilized a transect approach, which addresses wildlife, wildfire, and transportation concerns where the city abuts permanent natural areas. Diversified the housing mix so that residents will have a variety of housing options. Used Bend’s existing urban land wisely, with infill and redevelopment focused in key opportunity areas. Zoned for new walkable, mixed use and complete communities while also complementing existing communities in Bend. Met state requirements so that our city can move forward with a clear plan for well-designed growth. 2014 projections showed a need for 13,770 additional housing units by 2028. As of September of this year, 35% of that need has been met! A whopping 1,447 of those new units were built/approved within the first nine months after the UGB was implemented. Since none of the expansion areas have been annexed into the city yet, all of the new housing units that have been approved/built since the UGB went into effect were within the existing city boundaries and were aided by code changes or "efficiency measures" adopted with the UGB package. Read about the UGB efficiency measures here. While we know the City of Bend has a long way to go toward housing affordability, we wanted to take a moment to celebrate the progress made so far.